The Buddhist deity Bishamonten is enshrined in this hall inside a cave, in memory of the 9th century military victory of Sakanoue no Tamuramaro. 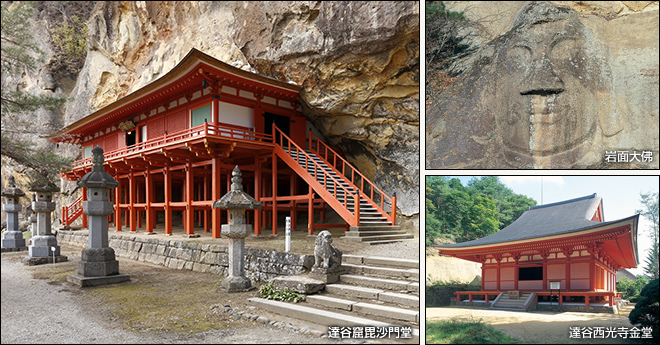 The Bishamondō Hall, built below an overhanging cliff, has been rebuilt many times after fires. The Heian period, large statue of Buddhist Wisdom King Fudō Myōō (designated a Cultural Property by the prefecture) and the Ganmen Daibutsu (an image of Buddha carved in the rock face and the northernmost in Japan) are of particular note. The entire grounds have been designated a Historic Site.